Introducing electrically charged droplets into a naturally occurring cloud will affect the collision probabilities and hence the rate of droplet coalescence to produce raindrops, and depending on the nature of the cloud result in increased rain drop growth. This forms the basis of the ATLANT™ model. Negative ions are generated from a corona discharge wire array. 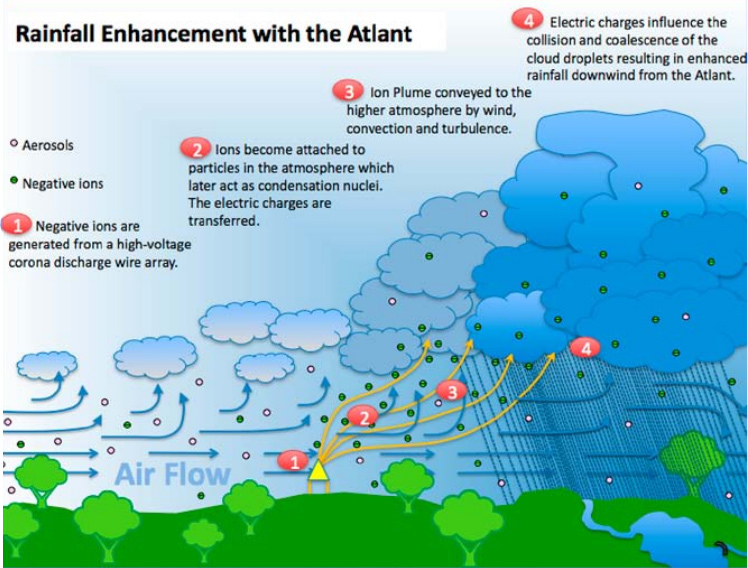 The ions become attached to particles (aerosols) in the atmosphere, which later act as cloud condensation nuclei (CCN). The charged aerosols are conveyed to the higher atmosphere by wind, atmospheric convection and turbulence. Water vapor condenses on these charged aerosols to form charged rainfall droplets (initially 1-2 microns in diameter). The electrostatic forces on droplet interaction (charged and uncharged) promote the coalescence of the cloud droplets and accelerate their growth to the minimum1 mm diameter necessary for droplets to fall as rain. Charged particles rising on air currents.